It is a great pleasure to welcome you to the 11th Conference of the European Association for Clinical Pharmacology and Therapeutics (EACPT) in Geneva. 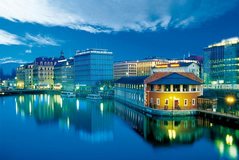 Under the auspices of the Swiss Society of Clinical Pharmacology and Toxicology and the other sponsors, the Congress will take place from 28 to 31 August 2013 at the International Conference Center Geneva (CICG), in the smallest of the world class metropolis. Clinical pharmacology provides a wide array of services, from excellence in patient care, teaching and clinical research to high standard efficient contribution in drug development and professional services in regulatory bodies. The Conference is a unique opportunity to meet top ranking specialists of various professional backgrounds involved in drug discovery, drug development, pharmacology and pharmacotherapy teaching, drug use, drug epidemiology, and drug safety. I hope that the exciting topics proposed in the program stimulate your interest to join us next year in Geneva. This prize will be awarded for significant achievement, both for the benefit of science and also for the benefit and health of the specialty, over a whole working life. This prize will be awarded for the best scientific paper on a topic relevant to clinical pharmacology published by a European clinical pharmacologist in the two years between the congresses EACPT2011 and EACPT2013.